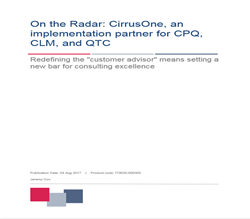 CirrusOne, a leading multi-vendor quote-to-cash (QTC) consulting and implementation firm that is redefining the role of the trusted advisor, announced today that Ovum selected the firm for its “On the Radar” report series for its innovative approach to delivering professional services. The report recognizes CirrusOne’s core principles, which the firm adheres to in all of its engagements, as one of the firm’s key differentiators and one of the reasons behind its high rate of customer success. Ovum’s “On the Radar” report is a series of research notes about vendors bringing innovative ideas, products or business models to their markets. CirrusOne helps clients go beyond configure-price-quote (CPQ) to provide a complete QTC solution, including contract lifecycle management (CLM). The firm is aiming to redefine the role of the trusted advisor with a unique approach to project methodology that provides customers with better odds of success. Finding and nurturing employees with the right consulting skill sets (not technical) is the starting point for CirrusOne. Ovum is a market-leading research and consulting firm focused on helping digital service providers and their technology partners thrive in the connected digital economy. Through its 150 analysts and consultants worldwide, it offers expert analysis and strategic insight across the IT, telecoms, and media industries. Founded in 1985, Ovum has one of the most experienced analyst teams in the industry and is a respected source of guidance for business leaders, CIOs, vendors, service providers and regulators looking for comprehensive, accurate and insightful market data, research and consulting. With 23 offices across six continents, Ovum offers a truly global perspective on technology, communications and media markets and provides clients with insight including workflow tools, forecasts, surveys, market assessments, technology audits, and opinion.